How to Fussy Cut! A Lucy Boston Quilt-Along. The original Patchwork of the Crosses, a HUGE English Paper Pieced Quilt made by British Author, Lucy Boston, has long been on the bucket list of many a quilter, and because of that, held little appeal to me. Everyone else had made one, or started making one. Why did I need to? I had admittedly played with a Lucy inspired block, which quickly became shelved as a long term WIP, but I hadn't really thought of going the whole shebang until my friend from Free Spirit contacted me and asked if I'd make a modern interpretation of the quilt for Quilt Market to showcase their new colllections. When I made my modern Lucy Bostonearlier this year, I had the constant thought as I stitched away, mostly in secret, that I really should be doing this with all of you! It turns out that this block is PERFECT for venturing into fussy cutting. The quilts blocks are all made only from honeycombs, so I spent a lot of happy moments, moving them around, turning them upside down, and discovering lots of wonderful secrets about fussy cutting that I hadn't yet from other shapes. So over the next many weeks, I'll be making another Lucy's Terrace quilt, just 1 block a week (there's 18, plus 10 half blocks and 4 quarter blocks), and showing videos of different stages on Instagram and Facebook. I'm using the hastags #lucybostonQAL and #lucysterracequilt if you'd like to follow along! Every so often I'll pop back here when I want to explore something deeper than what can be said in a caption or 1 minute video. If you have Lucy Boston blocks laying around somewhere, bring them out into the light and join in! 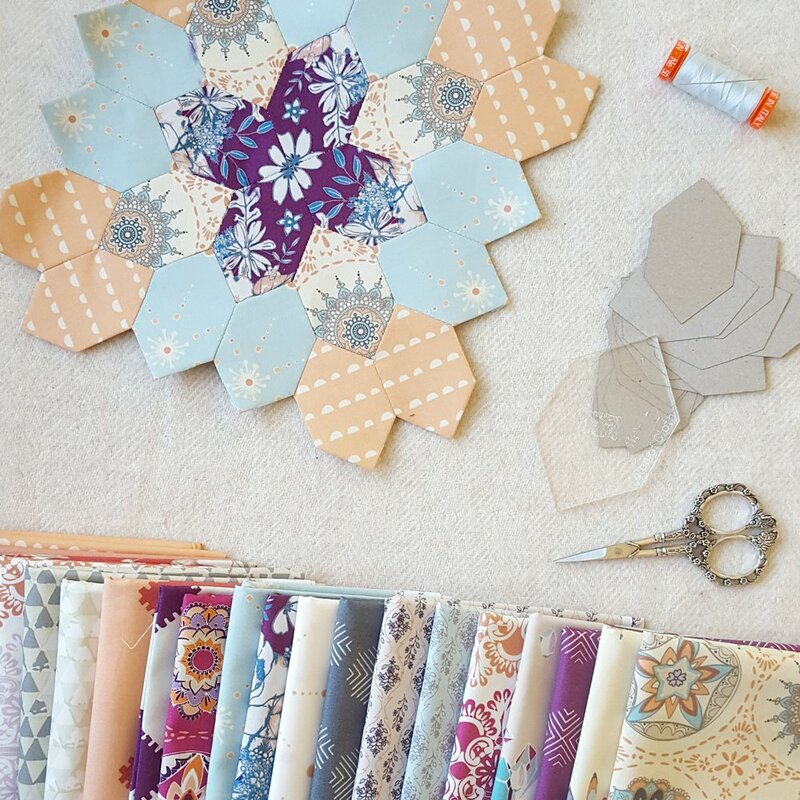 You don't have to be following my pattern to use the #lucybostonQAL tag and enjoy a bunch of other inspiration. Towards the end of the year, I'll show a selection of different ways to layout your blocks, just in case what has held you back from finishing is a lack of certainty about the finished look. Lucy's original isn't my style, but there are lots of different ways to go! Lucy's Terrace pattern is available here. You can purchase the complete Paper Pieces kit WITH acrylic template here. Or, if you just want to play, you can purchase honeycombs and acrylic separately. 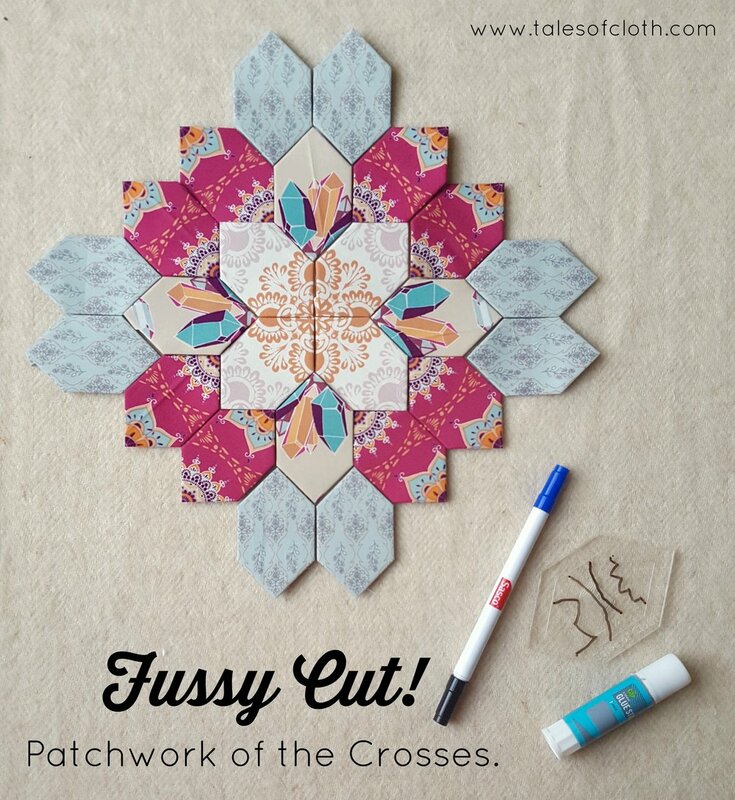 Let's learn how to fussy cut! 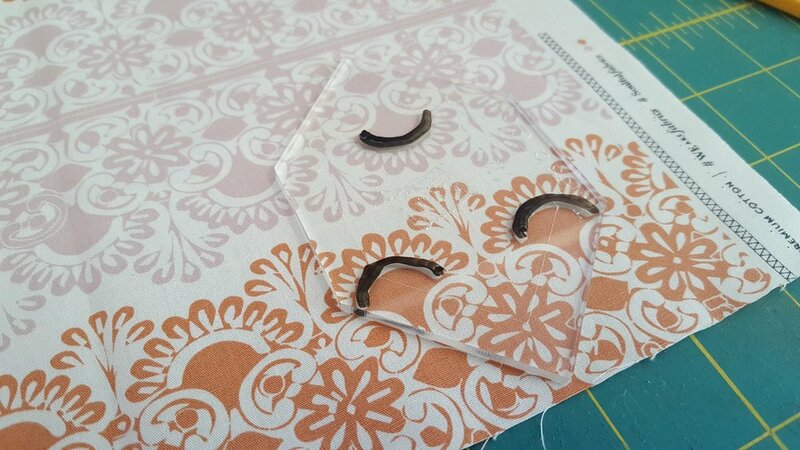 One of the most common questions I get asked is about fabric requirements for fussy cutting. It's a pretty tricky question to answer because it depends entirely on the size of the print and how much you want to use it. For my quilt, I bought a half yard bundle of Maureen Cracknell's Soulful fabrics, which has 20 prints. I really like buying new fabric that I set aside specifically for fussy cutting, because then I don't hold back or grieve all the holes I'm putting in it! You can see a little from the picture above that there's a real mix of large prints and small, just as there is in any collection. Many of these prints have SO MANY repeats of the same pattern in a small area, so I probably only needed a fat quarter of those. These are great for easy, minimal waste fussy cutting, but they don't hold a whole lot of options for interesting effects. Then there are a couple of prints that only repeat twice on a half yard, so for four or eight cuts for my Lucy Block, I really should have bought a whole yard or more. The image below shows most of a half yard cut of Floral Universe. When looking for the repeat, I'm not really looking to find the outside line of the exact pattern they printed over and over (which is technically what a repeat is), I'm just looking for the same part of the pattern over and over on my piece of fabric. On the print below, I can only find it twice. This doesn't really bother me though. I can get creative! See the purple centre of the block above? It's the other colourway of the print below, and I decided just to try and match the centre and have 2 different alternatives. In a print like this, the artist will often flip over, resize, or reuse a central design different elements. Even though there are only 2 repeats of the overall design, there are lots of repeated elements - leaves, sprigs, flowers. The whole honeycomb might not look the same, but you can still create a pretty design. My favourite kind of print to use for kaleidoscope effect is a medium design like the one below. As you can see, it has several repeats in a small area, but still enough variation for lots of fussy cutting options. Maureen's Mandala Harmony has 2 different rows, each with 2 different mandala designs. (Isn't it beautiful!) To fussy cut this print, you can choose any side of any flower to create a different secondary pattern. Keep in mind though, that you need to take from the same side of the flower with each cut. I'll show you how next. To fussy cut like I'm about to show you, you'll need an acrylic template, a whiteboard marker, a tissue and a rotary cutter. When I was filming with Quilters Companion a couple of months ago (video tutorial coming in next month's issue! ), I borrowed a rotating cutting mat. It was very cool and I may end up getting my own, but I'm always slow to buy new tools. I like to see if you can do it without them first. And I never want to make people feel like they can't give something a go because they don't have the right stuff. You can do this without a fancy mat, but it does feel a little dangerous, and it's tricky to cut the lower side with a small rotary cutter. If you're a clutz, get a spinny mat or mark your fabric with pencil and cut it out after. I should also mention that I made my entire Free Spirit version of this quilt without an acrylic template. I just remembered where I matched up the corners each time and then cut an approximate 3/8" seam allowance, and then I lined up the template in the same spot on the back for the fabric to baste it. Easy peasy. 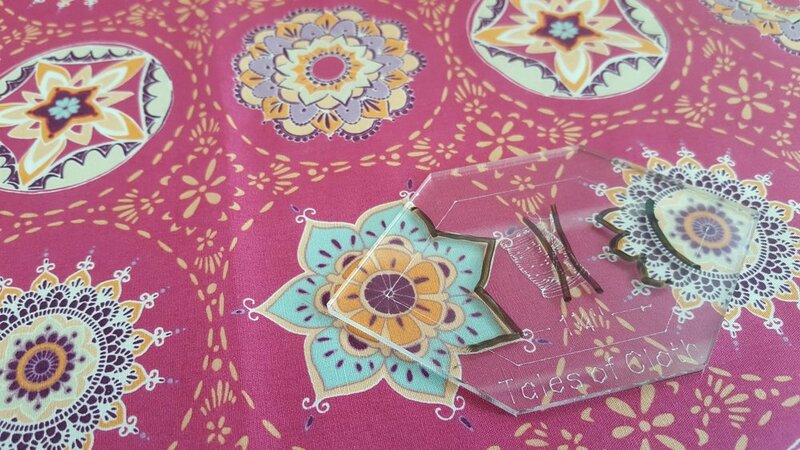 But it is nice being able to see through the template, especially for centering a flower or picture. and drawing on it makes it super fast. One more note: This design requires 4 cuts for the first two 'rounds' and 8 cuts for the next two. But because I always get a little surprise about which patterns look best where, I cut 4 of each first, have a play, and then cut the remaining 4 of the two patterns I put around the outside. 1. Find the section of the design you want to cut 4 times. Place the Acrylic Template over the print and mark the main outlines of the design. 2. Cut around the template, holding it firmly in place. Here's another favourite medium print in the collection: Deepest Purpose. Lots of possibilites with so little waste! 4. Once you've cut 4 of each print, centre the paper template on the honeycomb to baste. Then have a play! I decided to use the top right in the second picture as my centre, followed by the crystals. So then I cut 4 more of the other two prints to make up my block. you'll see the pretty blue print doesn't really create much variation in a secondary pattern, but I think the prints like this in a collection to provide balance and support for stars of the show. I like to have at least one in each block, and they usually end up towards the outside. Continue to my Lucy's Terrace pattern for a great way to stitch them together! I really enjoy fussy cutting honeycombs because of the feeling of freedom to swap things up later if the block doesn't look the way I imagined. And I love working with one collection of fabric, because the work of choosing a colour palette and a balance of prints has been done for me and I can dive right into cutting. When there's lots of decisions to make about design in one quilt, I like to hand over some to someone else so that I can focus on learning about creating secondary patterns. Lucy's Terrace is a modern Patchwork of the Crosses, and considerably smaller than the original 92" x 105" (shikes!). If you've been thinking of making one, but don't want it to take the rest of your life, try my complete kit and stitch along with me!